Shop Us & with our Partners! 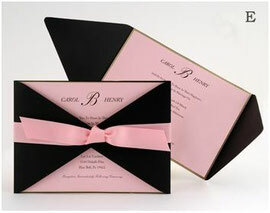 Our experienced staff is skilled in helping you create the invitation that's just right for your wedding. To get the process started, here are some things for you to have in mind when we sit down to design your invitation work of art. Start with your guest lists from both families. Often the bride and groom don't have a total count from themselves and their respective mothers. The number provided should account for households to be mailed to, not the number of individuals on your guest lists. Everything is based on the number of invitations to be produced. Without an accurate number of households, you may order too many invitations or delay the process until an accurate number can be determined. Do you have your colors/theme selected? If you have color swatches from a dress, event place linens, or a picture you admire, please bring them with you. Colors come in many shades and hues, and are listed by different names. When constructing a color scheme, samples are always best. A sample will help us find just the right match. Do you know when your caterer needs a head count for the meal? You may be thinking, "Why do I need to know that now?" This is a key point when setting the "Respond By" date for your invitation packet. Will your reception be at the same place as your ceremony? If so, you may want to consider adding a line to the end of your invitation that will read: Reception immediately following ceremony in the Garden Room. This may save on items to be included in the invitation packet. If you have an invite that you have received or found, please bring that in so we have some sort of idea as to what you are looking for or email it in before you arrive so we can start the process for you before our first meeting. Do you have the physical address for your venues? Sometimes the venues will provide their mailing address since they assume you know the physical one. Check with them on the physical address & ask if this will come up should your guests Google the location. These may be different if the venue is not located in the city. What do I need to consider during the initial planning process for my event/announcement? Timing is everything. Don’t forget that the save-the-date or invitation is usually the first thing the recipient will see to get the essence of the event or announcement being delivered. But most times it is the last thing to be considered when planning. Work backwards in your schedule and leave enough time for the recipient to receive the communiqué, mark it on their calendar and respond to the invitation. Allow time for delivery, time to get it printed and produced, time to get the product ordered and delivered, time to get it designed and proofed, time to get your list together and most important time to relieve stress. With all that said, Aly Am Paperie, an Envelopments dealer, takes great pride in delivering great products with a quick turn-around production time. What do I need to think about when designing with Aly Am Paperie? First, think theme. As you get started think about the look or tone of the event and imagine what style or flavor is desired. You may wish to embrace the season, reflect the location, match the attire or convey the level of formality for an event. Perhaps this will influence the initial decisions about color and pattern combinations. Next, consider content. Determine the information required to be communicated. Response cards and return envelopes, maps, photos and text will help define the shape, size and capacity necessary to contain the communiqué. Then, question quantity. On the guest list, remember to base the count on the number of addresses being mailed to versus the total number of guests. Also consider ordering overages to compensate for standard loss during the print, assembly and addressing processes.